This week’s Power Rankings are, no surprise, creepy and kooky, mysterious and spooky—you might even call the list altogether ooky. We’ve got your Halloween needs covered with witches, spiders, haunted houses, and the sort of indescribable Curious Creations of Christine McConnell. And if you’re counter-programming that neighborhood costume party, well, we have options for you there, too, from a Simon & Garfunkel-inspired ode to pretzels to Amber Ruffin trolling Megyn Kelly. Whatever your feelings about the holiday, the following 10 titles are perfect to watch with a bowl of candy in your lap. 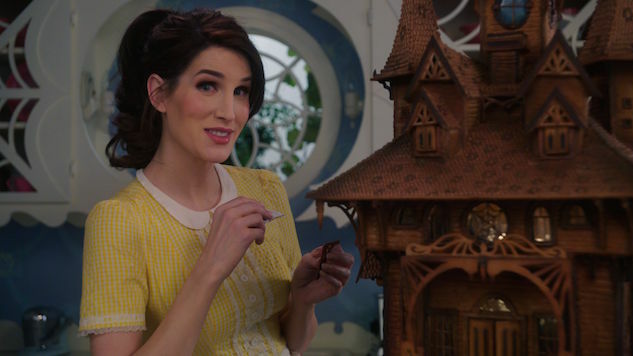 The Good Place was MIA for the past couple weeks, Team Cockroach spinning its wheels on Earth in a pair of episodes that would have shot any other show straight to the top of the list, but which for a show of The Good Place’s exquisite caliber were only great. With “The Ballad of Donkey Doug,” though, the wild ride that is Mike Schur high on moral philosophy and sick Florida burns is back with a vengeance. Now renamed the Soul Squad, our heroes spend this episode on opposite sides of the globe—Eleanor, Chidi and Janet in Australia, helping Chidi figure out how to cut ties with Simone to ensure he never slips up and dooms her to the Bad Place by telling her about the Bad Place, and Tahani, Michael and Jason in Jacksonville, on a mission to save Jason’s dad’s soul. Imagine all the camp and circumstance of creator Roberto Aguirre-Sacasa’s other series, The CW’s Riverdale, but with more blood and without the stringent Standards and Practices limitations that network TV requires. Mad Men’s Kiernan Shipka stars as the titular half-witch in this horror series based on Aguirre-Sacasa’s own comics. Someone much more in line with Harry Potter’s Hermione Granger than the bubbly and bright version of the character that Melissa Joan Hart played on the sitcom, Sabrina, the Teenage Witch, this Sabrina is a juvenile conjurer for the woke generation. She stumps for inclusivity, takes on bullies and is defiant of elders who tell her to slow down and learn the basics of magic before jumping ahead to the advanced stuff. (In this version, sadly, her cat doesn’t talk. Sorry to bum you out, Salem GIF lovers). Why should she sign her name in the Book of the Beast and let Satan—some guy she’s never even met—have jurisdiction over her body?